Don’t you just love being so scared you get goosebumps all over your arms? Or so thrilled by a car chase, your legs can’t stop twitching? 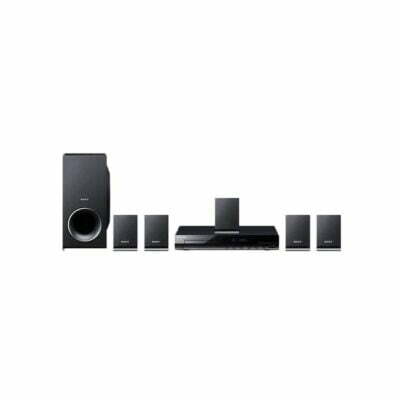 Sony DAV-TZ140 – 5.1Ch DVD Home Theater System makes all that possibe. You have to agree that sound is a huge part of watching TV. You’ve got to admit, USB drives are handy this days. With Sony DAV-TZ140 – 5.1Ch DVD Home Theater System, all you have to do is slot one into your DVD system and you can play photo slideshows of your deep sea fishing adventure, video of your brother’s wedding and rock anthems you’ve downloaded. It’s also an easy way to get stuff off your PC and onto your TV. It gets busy down there under your telly, especially if you have a separate DVD player and home cinema amp. Better to get it all in one and save on precious space. You’ll find this system fits well in your living room with slim styling, micro satellite speakers and a compact subwoofer. You can even hang the speakers on the wall, if you like.